Drive an E39 BMW 540 or M5 and one of the biggest complaints you will have is the steering feel and feedback. The powertrains are great, but the ancient reduction box steering system with recirculating ball power assist feels like it's been adapted from a trash truck. Only the lowly inline 6 powered E39s got a proper rack and pinion system, allegedly because of packaging issues with the BMW DOHC V8. However, you can have your kuchen and eat it too if you swap a pushrod V8 into the front of an inline 6 equipped E39 and put the beefier M5 LSD in the rear. 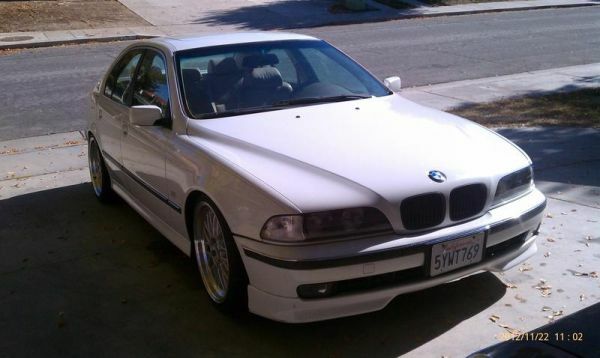 Find this 1997 BMW E39 "557" w/ Chevy LS1 V8 swap in Palmdale, CA offered for $10,900 via craigslist. The E39 is a handsome sedan from any angle; it is the last of the type of car that littered BMW lots for decades, the classic aesthetic that predated the Bangle flame styled abominations. Originally this 528i would have come with a less aggressive body kit/ground effects - but it has been updated with a lip spoiler from the aftermarket or from a 540i. 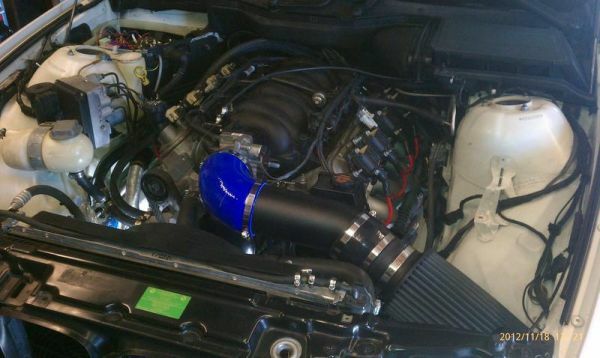 Just pop the hood on this 557i to understand our new nomenclature - it is a 5.7 liter alloy overhead valve V8 from a 2002 Chevy Camaro SS. In stock form the LS1 puts out 310 horsepower and 340 ft-lbs of torque, but this one has a few bolt on parts and is probably good for something closer to 350 horsepower and should weigh considerably less than a 540i or M5 due to the uncomplicated nature of the Chevy Gen III V8. It has been recently smogged, so you can transfer the title, but it will need BAR approval in two years to continue to be driven on the street in California without slipping Benjamins under the table to your friendly neighborhood smog guy. But the official cert shouldn't be a problem if the swap was done right, and the LS1 probably pollutes less than the inline 6 it replaces. 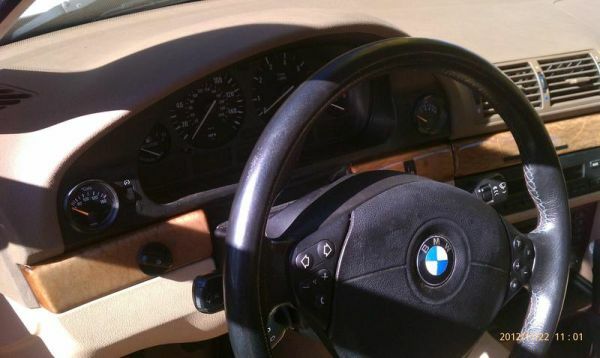 The seller admits the inside needs some work; the wood trim is cracked and the seat foam is lacking, but it looks like it's got an M-series steering wheel swapped in and the rest shouldn't be too hard to sort using your local European pick-a-part. The icing on this nonedible cake is the use of a 6 speed manual trans instead of an auto and a rear subframe swap from an M5, so that you have the limited slip and your axles won't just pretzel at the first stop light. Even without the BAR legal sticker under the hood, this is a really tempting car for the price and earns our stamp of approval. Dunno which I'd rather drive...the LS1 is certainly cheaper to maintain, but swaps always have compromises (AC not working etc). 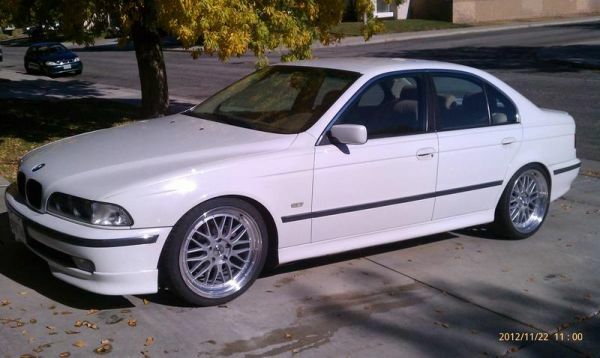 I never found the E39 M5's steering lacking in feel, especially compared to all current cars. This car looks like it'd be outside a pachinko parlor in Little Tokyo, driven by a tattooed 30-something-year-old wearing a too-tight black shirt and black jeans. We're can I get a LS1 swap for my e39?